My mission was to bake a semi-healthy breakfast item that the kids could eat for breakfast on the go. I know breakfast on the go isn't optimal, but when your daughter is more focused on fixing her hair than eating breakfast and you don't want her to be tardy, you make do with the best of intentions. I found a really great Bakery Style Chocolate Chip Muffin recipe here by Little Sweet Baker. 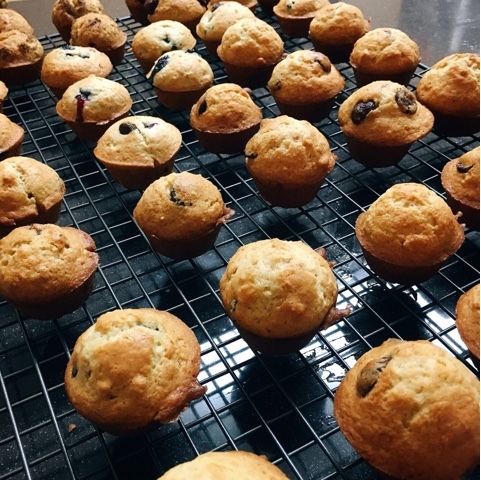 I decided to make a variety of mini muffins so I split the batter and added a mixture of chocolate chips, nuts, blueberries, and even black sesame. I even sprinkled a couple with Garden of Life Super Seed - a blend of seeds, grains and legumes that tastes a bit like cinnamon. Since they were mini muffins, I baked at 400 degrees and kept a close eye on them. They baked well at 10-12 minutes. I love my muffins golden and crispy and these came out perfect!